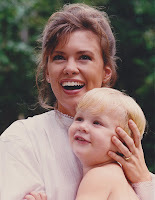 For years, I've played "the Mom" on TV commercials and print ads. I host a Simple Meals Cooking Show, and I've sold Mommy products on shopping channels. All of these adorable children in the photos above are not mine. Don't we look happy and calm? Now, I'm the real Mom of 2 boys. They are three and seven years old. The reality is completely different! Our life is non-stop chaos. I tried to live up to the image of the perfect Mom. I tried to fight the chaos. I've finally learned to embrace it. I still make TV appearances as a "Mommy expert" and work in commercials, but now, I'm a real Mom. I know what it's really like! As a chef, party planner and TV personality, I've learned a few tricks. I also find out about the latest Mommy products. I hope you enjoy our adventures as well as crafts, recipes, tips and reviews.